Athlete’s Foot – How To Prevent It? A common form of skin inflammation brought about by the fungal infection is called as Athlete’s Foot and is most commonly seen among the athletes. In medical terms, this condition is called “tinea pedis”. This generally starts in between the toes and gradually moves towards the toe nails, if left untreated. In the later stages, this infection has the tendency to move towards the palm region of the hands and other body surfaces, if left unchecked. Most often, this condition is referred to as the ringworm of the moccasin feet. Athlete’s foot can be transmitted from one person to another either by direct or indirect contact. Any environment that is warm and moist serves as the perfect breeding place for the fungal species to cause this condition. Getting them treated before the condition spreads to other parts of the body is a very important step that has to be taken by the person who has been diagnosed with this disease. Instead of worrying about the condition after it has set in, a few remedial precautions can be taken to prevent the onset of this disease. Clean shoes and socks: The socks have to be changed at least twice a day and these must be able to absorb the sweat from the feet. Using a medicated powder: Normal talcum powder or an anti-fungal powder can be applied to the skin where the irritation prevails and this kills the fungi that might form on the surface. Precaution after swimming and going for walk: The region between the toes has to be wiped clean after swimming, bathing or going for a long walk. The basic idea is to remove the excessive moisture from the skin. Using socks and sandals: The sandals must allow some breathing space for the skin on the legs and when at home, socks without shoes can be worn. 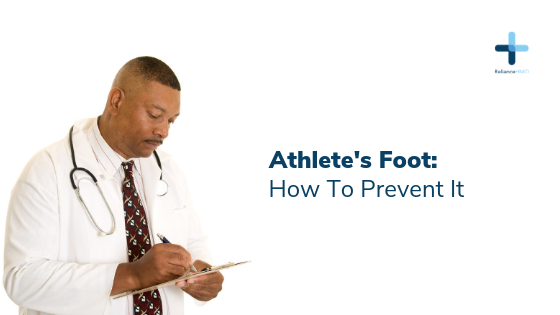 Preventive measures help a great deal in avoiding the complications that arise out of this Athlete’s foot.